Pre-heat the oven to maximum and lightly oil a large roasting dish. 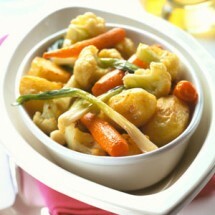 potatoes, carrots, peas and turnip 10-12 minutes. spring onions, mushrooms and spinach for 1 minute. Place all the vegetables in a large bowl. Mix the vinegar, minced garlic, chilli and olive oil together, pour over the vegetables and stir to coat well. Season with salt and pepper, add the bay leaves and drizzle with a little oil, place in the roasting dish. Cook in a hot oven for 30 minutes. Shake the roasting dish from time to time to prevent sticking. Vegetables can be changed according to seasonal availability. Avoid beetroot as it colours everything. Delicious served with crusty hot garlic bread.